Plants shipped in late summer and exposed to 50F often are chill damaged. However, when shipped in the winter or spring they are not damaged at this temperature. In general, plants shipped in the spring exhibit better postharvest characteristics than those shipped other times of the year. Cultivars reported to exhibit good postharvest characteristics include ‘Midnight’, ‘Midnight Princess’, ‘Indigo’, ‘Wintergreen’ and ‘Florida Spire’. Growing container shape can influence plant growth with a 1:1 diameter to height generally the best. Faster growing clones and cultivars generally have better postharvest characteristics (survive better under interior conditions). The proper use of a growth retardant can greatly extend the harvest period. Member of the Moraceae (mulberry family). Native to India, Asia and Tropical Australia. Common relatives include mulberry, osage-orange, fig and hops. Leaves are elliptic, pointed, up to 5 inches long. Stems are woody. The sometimes-present air roots add a distinctive character to this species. ‘Decora’ is probably the most common cultivar with its broad, shiny leaves with reddish color underneath whereas ‘Burgundy’ has red leaves that tend to turn purple under low light levels. Chill sensitive, store at or above 55 degrees F. Does well if transported in 21 days or less at 60F. This species is classified as an “epiphyte” or air plant when young as they grow on other plants and elevated supports. They are not parasites but obtain water and nutrients through a spongy covering of their roots. Ficus: ancient Latin name for fig. Broken leaves and cut stems exude white latex that can become messy for consumers. 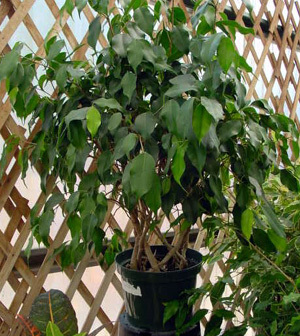 Growing plants in light colored pots does not reduce plant quality as it does with other species like poinsettia. There are many clone and cultivar differences which can greatly influence how each will perform under indoor conditions.